Blueberries are a favourite at our home. Fresh or frozen, these small round blue fruits are always in our fridge/freezer. When they're on sale at the supermarket, we get heaps and freeze them. They're the gold nuggets of fruits. Full of antioxidants and Vitamin C. Add that to a sugar-free muffin batter and you've got something that's a real treat - in taste and in nutrients. Don't get me wrong, we love our sweets and desserts and cupcakes at home, but there are times when healthy is the best route and best way to exercise restraint. Of course, I'm talking about the adults in our home. These are muffins are moist but has that slight crunch on top thanks to buttermilk and just smells divine coming out of the oven. To make this guilt-free muffins, I've substituted Natvia 100% Natural Sweetener for the same amount of sugar called for in the recipe, inspired by the Australian Women's Weekly Best Food Cookbook. 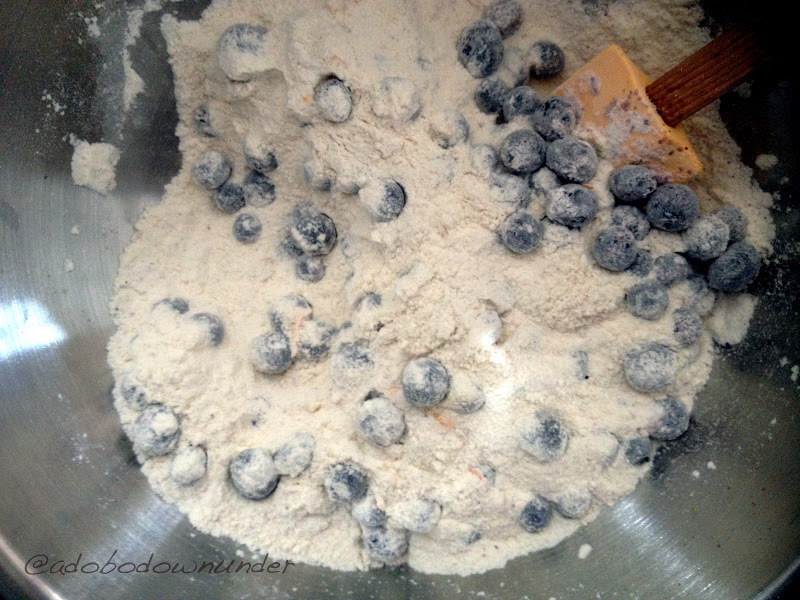 Slowly stir the dry ingredients with the blueberries to avoid too much bleeding of the fruits into the batter. 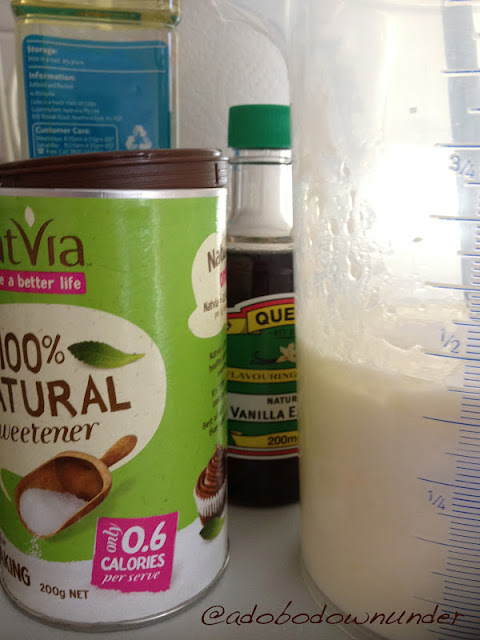 In a jug or large measuring cup, mix together buttermilk, oil, egg and vanilla. In a large mixing bowl, combine all dry ingredients and zest and stir to combine. Add the frozen blueberries and gently stir. Add the wet ingredients and the orange juice into the dry ingredients and stir slowly using a wooden spoon to incorporate the ingredients together. Do no over stir. Scoop the batter using an ice cream scoop or a tablespoon into the lined muffin tray, two thirds full. Place in the oven and bake for 25-30 minutes or until the tops are golden. A skewer should also come out clean when you test for doneness. Leave to cool in the trays for 5-10 minutes then transfer to a wire rack. A healthy treat in lunch boxes and take-to-the-office morning tea. These are guilt-free muffins. So really, there's no need for restraint. But if you need to, just keep them in airtight containers in the fridge and warm in the microwave when you need one. Or two. I adore blueberry muffins - these look go good! Thanks JJ! Enjoying all your holiday pics! See you at the EDB! Gorgeous! Thanks for sharing, I'll be giving them a try!